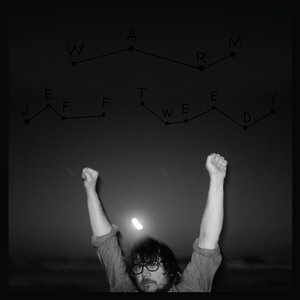 Wilco's de facto leader Jeff Tweedy releases his very first solo album of all-new material, and it's a quiet, powerful statement from one of America's greatest living songwriters. Twenty-three years after Wilco's debut album and 28 years after the first Son Volt release, it seems odd that Jeff Tweedy is just now getting around to releasing a solo album. Truth be told, his first "official" solo album came out last year – Together at Last is technically a bona fide Tweedy album, but it was actually just an acoustic re-tooling of Wilco songs. Warm is his first solo album of all-new material. But he's not exactly hanging out there in the breeze, devoid of musical or familial comforts. Wilco drummer Glenn Kotche sits in one track, Jeff's son Spencer – one half of his duo project "Tweedy" – plays drums on several others, and his other son Sammy contributes synths and backing vocals here and there. And while it may seem like a solo debut would be an enormous leap of faith, most if not all of Warm will be – as its title suggests – something of a security blanket for Wilco fans who treasure the words and music of its leader. In fact, in a lot of ways, Warm comes off sounding like a collection of Wilco demo tracks. Without the angular guitar slashing of Nels Cline, the well-rounded instrumentation of utility player Pat Sansone, the skillful keyboards of Mikael Jorgenson, what you're left with is a modest selection of songs by Wilco's primary songwriter. With this comes plenty of open, honest songs that occasionally skirt areas of abstract poetry – one of Tweedy's many lyrical strengths – but more often than not are simple yet eloquent statements from a man in his early 50s with a family and a relatively stable home life. In his new memoir, Let's Go (So We Can Get Back), published earlier this month, Tweedy describes Warm's songs as "some of the most direct, personal and autobiographical that I've ever written". On the easygoing, twangy "Bombs Above", Tweedy gets confessional right off the bat: "All my life / I've played a part / In the bombs above / The ones you love / I'm taking a moment to apologize / I should've done more / To stop the war." He could be talking about his past struggles with a variety of vices, how a life of touring can wreak havoc on the home front, or perhaps it's something more personal to which none of us are privy. Throughout Warm, there's a somewhat low-key approach to the music that has made its presence known throughout Wilco's career, particularly on recent albums like 2016's Schmilco. Gone, for the most part, is the more overt experimentalism of his Jim O'Rourke-related side project Loose Fur, or Wilco albums like Star Wars or Yankee Hotel Foxtrot. Often, Tweedy seems to be channeling a more sedate singer/songwriter vibe reminiscent of early Neil Young. When the tempo picks up on "Some Birds", the acoustic guitar shuffles wistfully alongside understated countrified electric leads. "I don't think I should add one to the sum of all that you fear," he sings reassuringly in the chorus, but can't resist a touch of morbidity: "Is it my fault the countrysides are so full of suicide?" While Warm can evoke the feel of calm introversion, things occasionally get a little jauntier. "Let's Go Rain" is a fun, gentle singalong that seems to address Tweedy's feelings toward religious faith with a song-length Noah's Ark reference. But he often feels more at ease letting a smidgen of sonic blips and idiosyncratic production into the mix. "From Far Away" incorporates some of the noise beds reminiscent of Yankee Hotel Foxtrot, which meshes nicely with Spencer's complex start/stop drumming. Additionally, "How Hard It Is For a Desert to Die" is a bit of an odd duck in that it's arranged in an unhurried, almost whisper-quiet manner. The drums provide minimalist backing with soft, lyrical pedal steel stepping gingerly around Tweedy's lyrics: "I hear your laugh in my laughter / An old photograph I've never seen." While the album was recorded in Wilco's custom Chicago studio, the Loft, this particular song sounds almost as if it was tracked in an apartment with amps turned down and drums muffled so as not to disturb the neighbors. It's an unusual but disarmingly beautiful five minutes. The intersection of power pop and alt-country is an area where Tweedy seems to thrive, and the head-bobbing twang of "I Know What It's Like" fits the bill nicely, as does the somewhat more bluesy "Having Been Is No Way to Be", with straightforward lyrical moments like "Shining steady like a spider web / Is an empty stage / Now people say / What drugs did you take / And Why don't you start taking them again." Some arty electric guitar touches give the song the feel of an outtake from A Ghost Is Born. Befitting an artist of Tweedy's stature, author George Saunders (whose celebrated experimental novel Lincoln in the Bardo won the 2017 Man Booker Prize) contributes liner notes to Warm. In the notes, Saunders calls Tweedy "our great, wry, American consolation poet", a description that seems both lovingly thought-out and incredibly apt. "Rock stars" often seem untouchable and vaguely hostile. Tweedy, with his wife, sons, and regular-guy affability, is one of us. When he sings, he doesn't seem to be singing from some ivory tower. And when stripped of the confines of a band dynamic, that relatability is even more naked and genuine. Warm is Tweedy unfiltered, a gift that begs to be shared.